Astronomers keep finding new exoplanets. That is, planets that exist outside our own solar system. A recent discovery has astronomers stumped. The planet has been named SIMP J01365663+0933473 and several things make it stand out from other exoplanets that have been previously discovered. The VLA (Very Large Array) in New Mexico. SIMP J01365663+0933473 was discovered by the National Radio Astronomy Observatory’s VLA (Very Large Array) in Socorro, New Mexico. This is the first time a radio telescope has discovered a new exoplanet. It was originally detected in 2016, but after further research and observation a lot more is now known about the planet. The planet is rogue, that is, the planet is not orbiting a star. Astronomers aren’t entirely sure why some planets are rogue. The prevailing theory is that a rogue planet gets knocked out of its orbit around their star and they are flung into the depths of outer space. However some rogue planets are moving extremely fast and scientists have no explanation for this. While rogue planets do not orbit a star, they do orbit around the galactic center. The planet is massive, roughly 12 times the mass of Jupiter. Astronomers have found many planets like this, so many they have their own classification: Super-Jupiters. But what makes SIMP J01365663+0933473 stand apart from other Super-Jupiters is its magnetic field. The planet is 12 times the mass of Jupiter but its magnetic field is 200 times stronger than Jupiter’s own magnetic field. Astronomers are certain this new planet is not a brown dwarf, that is, a failed star. Brown dwarfs have masses between 13 and 80 Jupiter masses. Brown dwarfs are not large enough to sustain nuclear fusion of hydrogen into helium. Brown dwarfs just don’t have enough gravity to compress the hydrogen in their cores. 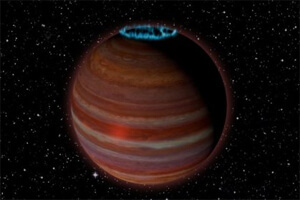 So why does this rogue Super-Jupiter have such a strong magnetic field? Scientists just don’t know. But further study of this new planet may expand our understanding of planetary and star dynamo mechanisms. That is, the inner workings of stars and very massive gas giants. SIMP J01365663+0933473 is thought to be about 200 million years old. That’s very young on a cosmic scale. It sits about 20 light-years from Earth, so it’s also pretty nearby on a cosmic scale. Its surface temperature is thought to be around 1,500 degrees Fahrenheit. Our own Sun has a surface temperature of around 10,000 degrees Fahrenheit.